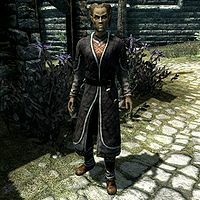 Taarie is an Altmer tailor living in Solitude. She runs a tailor shop called Radiant Raiment with her sister Endarie and can be found there during the day. Of the two sisters, Taarie is the friendlier, though still critical of your attire. Both sisters share the same merchant inventory and gold, so there is no need to deal with Endarie's rough personality in order to buy and sell at Radiant Raiment unless Taarie has stepped out. Taarie wears fine clothes and boots. She also carries the key to Radiant Raiment and an iron dagger, along with a selection of upper-class items and gold. Taarie may greet you with "If you're heading to the Blue Palace, you might want to rethink that outfit." or "If you ever want to replace those old rags, stop by Radiant Raiment." At her store, she has one additional greeting: "Why, hello! Here to buy? If you have to ask the price, you may be in the wrong store." Upon seeing you, she will comment on your outfit. If you ask her about it, she'll ask you to do a favor for her. Taarie is a potential candidate for marriage after agreeing to complete her favor and investing in her shop. You can ask Taarie if she always insults people when she meets them, which she will deny with "It's not an insult, just an observation. If I were walking around with a wound, I would want you to tell me to see a doctor. Your outfit is something of an open wound... where attire is concerned. Not many people care, these days. The world is the worse for it." If you ask what is wrong with your outfit, Taarie will reply, "Nothing at all. It's very... nice. If you want something with a little more style, however, you should come by our shop. Radiant Raiment. We could fix you right up." "Sounds easy enough. I'll do it." "Good. Here's the outfit. Try to get Elisif's opinion on it and if she likes it mention it's from Radiant Raiment." "Sorry, I'm afraid you'll make me look silly." "Look silly! As if you could look any sillier than you do now." After you've showed Jarl Elisif the outfit and told her that it is from Radiant Raiment, you can tell Taarie that Elisif loved the outfit and that she'll be placing an order soon. She will be pleased: "That's wonderful. You've done us a great service. As promised the outfit is yours and here's something for your trouble." She is the only Altmer you can marry in the game. If you invest in Endarie's store, you will be unable to invest in Taarie's store; they share the same goods, so investing in both of them would result in the store being invested in twice. You will thus be unable to raise Taarie's disposition high enough to make her available for marriage. If you're wearing Radiant Raiment fine clothes before obtaining the Fit for a Jarl quest, she will still comment on your outfit negatively. After agreeing to model for Jarl Elisif you will get the exact copy of Radiant Raiment fine clothes you wore. Taarie is her own merchant backup. If she's killed, she will not develop a replacement. This page was last modified on 7 May 2014, at 03:58.